As your specialists in roofing, siding, gutters, doors, and replacement windows in Vineland NJ, you can rest assured we give you the best materials and top-notch products. Here at Homecraft® Inc., our reputation for quality roofing, siding and other home improvement work is well known. You also get treated to personalized attention by our dependable, reliable, dedicated and friendly contractors who are committed to 100 percent customer satisfaction with more than 30 years of experience in this industry. 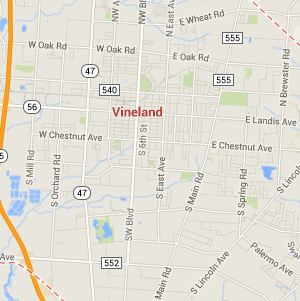 As a city in Cumberland County, Vineland is home to 60,724 and counting. This up and coming community was established on July 1, 1952, so named due to the plans of its founder to grow grapes for wine. It’s obvious why we’re the leading door company in your community! Let new doors warmly welcome your family and visitors. Let our techs install a weather-resistant storm door to protect your home or replace your old garage door with a beautiful new automatic door. With new quality siding, your home is well insulated and more energy efficient. Homecraft® Inc. can give you the traditional look of cedar shake siding or modern vinyl siding that needs little maintenance. With new siding in Vineland NJ, there’s no need to paint ever again. Protecting your home is a #1 priority, and a good gutter system is part of that plan. Strong, durable gutters can shield your home from water damage as well as your surrounding property. Vineland NJ homeowners can count on Homecraft® Inc. for top-notch gutter systems that efficiently divert rainflow due to rain, snow, or melt-off from ice. Our professionals are proud to install the highest quality roof possible on your home. Choose Homecraft® Inc. can help you implement smart home improvements, whether you’re in need of replacement parts or damage repair. FREE Estimates on Vineland NJ Home Improvement, Windows, Doors, Siding or Roofing. Call Homecraft®, Inc., today at 1-877-494-0377 to schedule a FREE in-home consultation and estimate for your Vineland NJ home improvement project, roofing, siding, replacement windows, doors, or gutters.